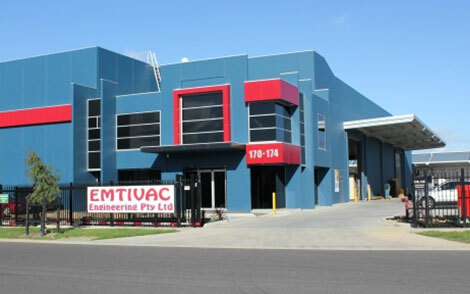 Australia’s leading vacuum pump and system solutions specialists, Emtivac has more than 30 years’ experience in supplying vacuum pumps and associated product and technology solutions for a wide range of process industry applications. Based in Dandenong, Victoria, we service both national and international markets with our proven ability to design practical solutions and boost efficiency demonstrated in recent projects undertaken in Saudi Arabia and Malaysia. Emtivac carried out a major project involving the design, fabrication and supply of eight liquid ring vacuum pump units for a new aluminium refinery in Saudi Arabia. Our N2BE/HE vacuum pumps with ductile iron end casings were selected due to their unique high efficiency design and low operating speeds at the duty points requested. Gearboxes were water cooled Siemens/Flender units with sunshades and electric motors from WEG. The skid was designed to withstand caustic process conditions and the harsh environment in the Saudi desert. The fully assembled skid for each of the Pan Filter vacuum pump had a total weight of 24,000kg. In co-ordination with some other Dandenong businesses, we carried out all engineering design and fabrication of base frames, piping and vessels, as well as arranged manufacture of heavy duty shipping crates to safely transport the skids to Saudi and to protect the units on site prior to installation. 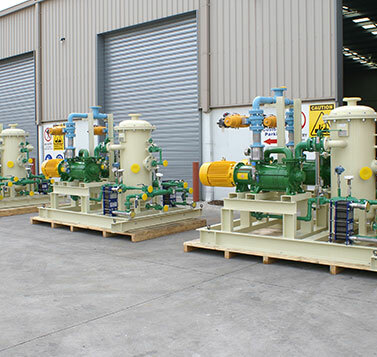 Emtivac also designed and manufactured a major project to supply two liquid ring compressor packages for flare gas recovery to an oil refinery in Malaysia. The package was designed around two of our NSB Liquid Ring Compressors, two stage design with double mechanical seal, 2000 m3/hr @ 5 bar each. It also featured two high voltage 500 kW 3300 V Flameproof Electric Motors and Hazardous area wiring with local & remote control panel c/w PLC control system including HMI screen with full integration into the Petronas DCS and Safety Systems. 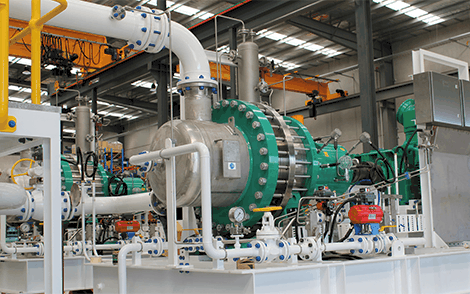 The entire liquid ring compressor system and electrical control system was manufactured in Melbourne and reassembled on site in Malaysia prior to commissioning. The FGRU now has over 3 years of continuous operation. 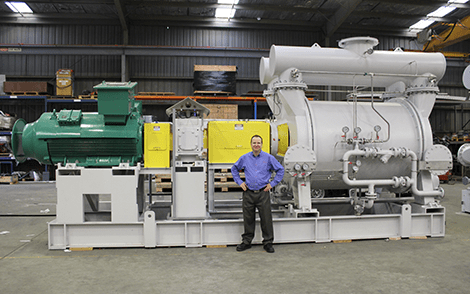 We are the sole Australian agents for Pompetravaini and their subsidiary NSB, two of the world’s leading manufacturers of liquid ring vacuum pumps and liquid ring compressors. Decades of engineering research, investment in technological and advanced machinery and sound mechanical know-how has made Pompetravaini synonymous with high quality, high efficiency, robust construction and maximum reliability. Emtivac ensures you get the right equipment for your industry requirements. Talk to us about your vacuum process issues and we’ll recommend efficient, cost effective solutions for your operation. Contact us today to find out more about our company, products or industry applications. We are also the exclusive Australian agents for world leading brands FPZ, dooVac, SVC and Baratti and the Australian distributor for ‘Mann Filter’ Vacuum Pump filters. 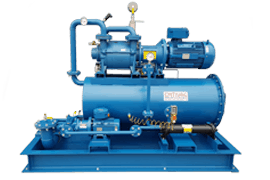 FPZ is a worldwide supplier of regenerative/side-channel blowers for the movement of air and technical gases. FPZ manufactures high-quality side channel blowers for pressure and vacuum applications, as well as related accessories. SVC manufactures dry screw vacuum technology for diverse applications. Dry pumps are designed under SVC’s unique screw profile engineering to fill a wide range of chemical and industrial processes by rotating paired screws that efficiently admit gases from inlets and compress through the screws’ swept volume toward the discharge. Baratti manufactures pollution free, low cost low pressure technology. The company develops, manufactures and sells rotary lobe blowers as well as dry running screw pumps for gas compression. dooVAC are an experienced high quality designer and manufacturer of Rotary Vane Vacuum Pumps for over 25 years. Based in South Korea, dooVAC have become leaders in the home market prior to experiencing success in exporting to Europe, North & South America and Asia. Doovac Co. Ltd has achieved independent Certification to ISO 9001 for Quality Management, ISO 14001 Environmental Management and CE certification in accordance with the European Machinery Directives. MANN+HUMMEL are the worldwide trusted name in filtration and are a leading global filtration specialist headquartered in Ludwigsburg, Germany with over 20,000 employees and have been in business for over 75 years. They manufacture filters for original equipment manufacturers in a diverse range of industries as well as the industrial vacuum sector.